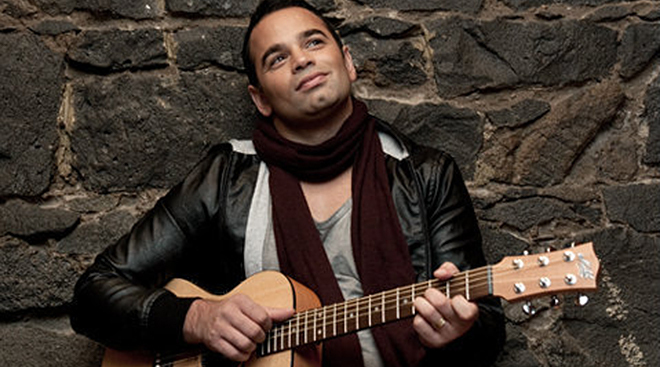 AN American-Jewish artist inspired Australian Catholic musician Gary Pinto to be more explicit about his relationship with God in his new EP, “The Future”. Pinto told The Catholic Leader that on a trip to Los Angeles last year he heard a song by Israeli artist Matisyahu, a man “very strong in his faith” and not afraid to expose it in his music. “I’ve always written songs that were uplifting and wanted to point people towards God but [Matisyahu] was very explicit in his lyrics, and I wanted to do that,” Pinto said. “The Future” follows Pinto’s first solo album from 2010, “Take Back Our World”, and almost eight years of performing and touring as lead singer of R&B dance group, CDB. He told The Catholic Leader his new EP “The Future” was “the closest thing to what represents” the 38-year-old today. “When I got to make this record it was really true to who I am and what I believe,” Pinto said. Staying true to himself, Pinto also released the album under the name Garfield Vaughn, his birth name. “My parents named me Garfield Vaughn when I was born, but I didn’t use the name throughout my life because I thought it was too much of a tongue tie,” Pinto said. “When it came to making this record it was really different to what I had been used to and what I’d been known to make in the past. Between launching his debut album and now the release of his new EP, Pinto and wife Natasha Pinto have travelled to New York, Los Angeles, London and hometown Melbourne for various music projects. He will be in Sydney for the next three months as a vocal mentor for contestants on Channel 7’s The X-Factor. A devout Catholic, Pinto said prayer and support from fellow Catholic musician and priest Fr Rob Galea had helped sustain him in his faith. A personal revelation almost 10 years ago stirred Pinto into completely surrendering his life to God. “I went through a terrible depression at 29 and I had lost all faith, not faith in God but faith in life really,” he said. “I went in to a very bleak time and I felt that I had lost the presence of God and I was just crying out to God for His comfort and His peace. “I ended up seeing a picture of the divine mercy in front of me, and what I wasn’t realising was I was carrying all my burdens on my own and everything was very distressing to me. “I said, ‘Jesus, under Your blood I give You my mind, heart, body, soul and will’, and as I said, this peace immediately descended upon my body, and this complete calmness came over me. “I knew this wasn’t only a picture, it was really a representation, an icon to point us to living treasure, that God is real and that His blood covers and protects and drives away anything that can harm us. “His blood meant new life and the water meant cleansing. Now the 38-year-old’s life mission is to let his music “praise God”. “I feel like music was made to praise God, to give God glory in everything we do and music is such a thing that is an inspired creation,” Pinto said. “So all musicians I feel are always tapping into the creativity of God in a new composition, a new creation. The Future is available now on iTunes or on the Gary Pinto Facebook page.